This is cray-cray, but sometimes I do it. I go on "shopping autopilot" and shop even though it makes no sense. For instance, at the moment, as I've mentioned, I'm shopping for a plain little black bag to keep the G9 in to make it easier to take it with me on drives. I want something black (car interior: black) and nondescript so it doesn't call attention to itself in the car. But then I wrote about Billinghams, and did some research on Billinghams (I actually heard from Martin Billingham, the founder of the company), and before you know it I'm off perseverating on a Billingham Hadley Small Pro (same as the Hadley Small but it has a detachable strap and a top handle). Looks really neat, nice and small, really like it...so I was thinking about getting it. And then I suddenly came back down to earth and thought, you idiot, it's not even what you're looking for. Why do I do that? It's like I turn into some sort of shopping robot. Think that's bad? It gets even more embarrassing. Occasionally, this has happened: I shop for a camera, get into the nightly habit of making the endorphins flow by reading reviews and feature lists and looking at pictures of the camera online. Then I buy one. Pull the trigger and buy one, meaning it's here, I've got it, "in the flesh" as we mindlessly say (nothing "fleshy" about a magnesium alloy and polycarbonate digital camera, but the only alternate phrase seems to be the equally inappropriate "in person")...and then I kinda miss the "reward" I got from shopping, whatever that was, so I find myself absentmindedly going back to those behaviors and continuing to "shop" for the very thing I already have. I'm not saying I do it every time, or often. I didn't do it with the G9. But I've done it in the past. I wanted a Leica M6 for so long that, after I got it, I still wanted to keep shopping for it. Shopping for it had become a habit, a pastime, an activity. I'd gotten used to it. It had become a thing I did. And it was hard to stop doing it. But I had my M6 sitting next to me on the desk while I was checking eBay for the latest M6's for sale. To quote Bill the Cat, "Aaack!" So anyway, a few corrections. I'm pretty sure now that my Billingham is a 225, not a 335 as I said in my recent posts. Four hundred dollars now, and maybe $180 when I bought it, not $280? (I used to have a memory, but I forgot where I put it.) That's it, above. It looks a wee bit woebegone in this pic with the heavy camera smushing it down, but it's actually just nicely worn in, like a serviceable pair of leather shoes. Nothing wrong with it. Mine is about 33 years old, and it's been used. What?! Fortunately, some other part of my brain quickly chimed in with, you already have one of those. Idiot. I'm a trained seal. Reflexive shopping! Gah. And to think, some economists think consumers are rational actors! I wonder if people ever start shopping for one thing and then shop themselves into something entirely different, and then find themselves placidly regarding the lovely thing they just bought while it slowly dawns on them that it's perfect except for one thing, which is that it isn't at all what they need. And that whatever they needed, they still need. I'm not saying that's ever happened to me, but I could see it. P.S. This post isn't about camera bags, it's about photo-dawg behaviorism. Dave Van de Mark: "The last paragraph of your post is the story of my life and explains why I am broke. :-) "
Eric Brody: "I think your (and my) reflexive shopping goes back to the Shutterbug era, though the Internet has greatly intensified it. I am not surprised—should I be?—that we have similar behaviors of continuing to shop even after the item has arrived. The shopping process in the Internet era is genuinely addictive. I have actually been disappointed when I finally obtain the item of my desire. I perseverate, I make spreadsheets of price, weight (in ounces, pounds, and grams). For items that are hard to find, I check all the online stores each morning and through the day (I'm retired so I can do this)...all day. Recently an object of my desire was actually available, and I had the funds for it, but I kept putting it off until it was no longer available. Then I felt better. 'Crazy' is the right word." Yonatan K: "Not just photo dawg behavior.... It is the 21st century incarnation of hunter-gathering." Bernd Reinhardt: "Tell me about it Mike. My 2005 Volvo S80 needs a new transmission for $3k. "I'm not going to put that much money in the old car. Time to get a Subaru Outback. It's a wagon with AWD. What? $15k for a six-year-old car with 70k miles? No way. What, it sold already? For $23k, I can get one out-of-lease with 40k miles. Oh wait, a company loaner with 5k miles and full warranty for $26k. Great, I think this would make the most sense. How much is the tax? Three grand?!? That's the price of a new transmission for my Volvo. 'I'm getting the Volvo fixed next weekend.' That same night, I'm sitting on my couch looking at Subaru Outbacks...."
psu: "Shopping is safe as long as you are not always buying. That's the secret. The Internet is in many ways the Golden Age of shopping (not buying) as a hobby." Patrick Medd: "Over the Christmas and New Year period I found myself being repeatedly sucked in by the Fuji cashback offers available at that time in the UK. The offer period was long (from Black Friday until 10th January) and, coupled with other sale offers which came and went during that time, I managed to acquire a 14mm ƒ/2.8 lens, an X-E3 with 23mm ƒ/2 Fujicron, and a 50mm ƒ/2 Fujicron. This despite the fact that I already own, at the last count, at least 847 different devices capable of recording an image onto film or electronic sensor. "All of the above Fuji purchases are now sitting on the side unopened, as I consider that I really shouldn’t have bought them and ought to send them back while I still can. But I won’t actually get round to doing it. Meanwhile, as they sit there awaiting their fate, a recurrent idea comes to me that this is now really the time to do the Leica for a year project and before you can say ‘eBay’ I’m looking at Leica M3's and investigating providers of CLAs of an evening. This despite the fact that I already have a Leica M5 which would definitely meet the criterion of being a Leica. "In summary, all the above just goes to illustrate that photo-dawg behaviourism isn’t a hobby, it is a DSM-classifiable self-destructive psychiatric disorder which requires an evidence-based treatment programme now. "That Billingham bag does look nice in that colour though. Think I will just go and compare specs and prices online…." Mike replies: Here's a skosh of evidence-based encouragement Patrick: an M5 would perfect for an OC/OL/OY project. Ideal. Jack Baty: "I bought a nice new bag two weeks ago, read your article yesterday, got to thinking, and immediately ordered the Hadley. Guilty." IPatrick Dodds: "I've been not-shopping-just-fantasising for a digital Pen F that I am definitely not going to buy for some months now." I think it’s just one of many possible expressions of GAS. Sometimes the emphasis is on the ‘G’ and sometimes it’s on the ‘A’. I sometimes also fall into a “collecting” trap, esp. with pens (luckily, I can’t afford to even start thinking about collecting cameras). I recently started buying a certain kind of pen, thinking I could get quite a collection of all the existing ones. Then I read an article about a fellow who had more than 350 different models of that pen. It was then I realized my quest was pointless and I’m now culling aggressively. A wonderful line that I read somewhere is, “There is nothing so disappointing as getting what you always wanted.” I am exhibit A. The bag screams "steal me." I'll make this really easy for you. Just get a Think Tank. Personally, I'd strongly recommend a Retrospective 5 in Pinestone Gray, but if the color is really a deal-breaker for you, then get a Spectral 8 in Black. Its just the right size for the G9 and a couple lenses and has a nice magnetic latch for easy access, Just under a hundred bucks, so its easy on the budget, too. I own three bags, including two Billinghams (both purchased used). The Hadley is a great bag for small kit. I use it for a D610 with a lens mounted and one or two additional lenses. The 335 I use when I want to take more stuff, although I'm not overloaded with gear now. I also have an old Urban Disguise from TT (bought on sale) that is great for air travel. I'm old, so I remember taking Zero Halliburton's and other bags on trips for shoots. Small is good, but so is nicely made. You like that in your cameras, do you not? Yikes. Too close for comfort. I will say, though, that I have found that getting kitted out with the best cameras/lenses I could reasonably ever afford has at least slowed that one down. But bags, holy mother of gawd. I think that's because none of them are really quite right. So, here's a business niche idea for someone, even a big company: bespoke bags. With CAD these days, you'd think that you could send in a list of your gear, and carrying options, and that bag could be made to order. As it is, there's a whole subset of configurable inserts for bags. Sadly, they're not quite right either. I do this too. A behavior I developed when I had money, a reasonable amount anyway. But now I have like zero discretionary dollars but the behavior continues, I do a lot of shopping, then sigh, remember I no longer have the funds. I am recovering though. I love Billingham. Personally I think they are inconspicuous as long as you don't get a beige one. I have the Hadley Pro and the Hadley Large. 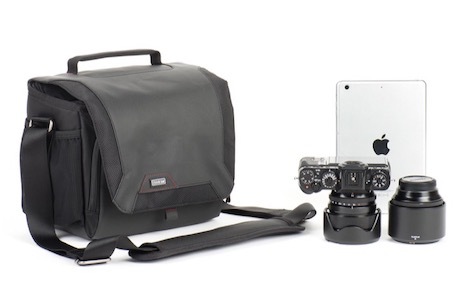 The Hadley Pro I use for a Canon DSLR plus 2 large zooms and the Hadley Pro Large for the DSLR full kit. I am also a fan of Domke and have the F2 (for a larger m43 kit) and an F6 for a smaller m43 kit. Great bags and they don't draw attention to themselves. The Hadley Small (unfortunately) I found a little too small for my m43 kit, so I went with the Domke F6. Lowepro are also good: I like their no-nonsense style. 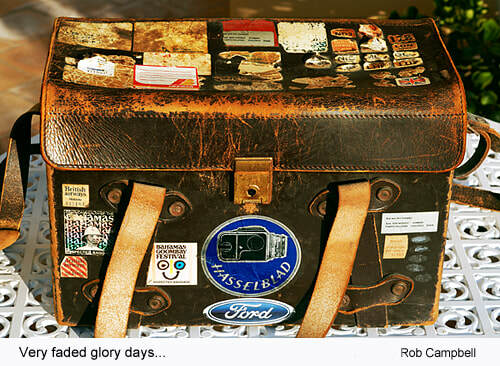 Pity about the "Lowepro" badging though: a little too prominent. Unlike everyone else I dislike/hate my ThinkTank Retrospective 30 bag: way too bulky and full of all sorts of irritating pockets and partitions. I also hate the velcro messenger bag flap. But I have to admit, if you really want to carry everything but the kitchen sink then you could fit it in the ThinkTank. I also happen to dislike back packs on principle. Makes me look as I am "hiking" when I am just walking, and nothing is accessible when you are on the move. Run around in circles as long as you like then get an old domke bag or a super cheap Amazon bag and remember that the money you'll save not getting the Billing-Gucci bag could go toward nice lenses or at least some decent filters. [Once upon a time there was a king from a Southern Kingdom who bought himself so very many cameras and other toys that he got himself into financial trouble and was forced to move out of his castle. He researched modern alternative building methods, and determined that straw-bale houses have a high R-value and would be cheap to heat. So he built his new house, and it was serviceable and lovely: a straw-bale house with a thatched roof. But then he didn't know what to do with his throne from the old castle, which was too large and grandiose for his modest new house; there really wasn't a natural place for it in the new house. Not knowing what else to do, he solved the dilemma by putting the throne in the attic, meaning to make the decision later. But one evening as he was entertaining guests at his dinner table, catastrophe! The heavy throne came crashing through the ceiling and landed in the middle of the dining room table! No one was hurt, but the room was a mess and the meal was ruined. People who live in grass houses shouldn't stow thrones, my friend. You're back onto camera bags again, Mike? You promised! Shopping: we all shop— sometimes “shopping and reading” is a better way to learn about stuff than reading the stuff on the internet. You need a bag to protect a small camera and a lens from bouncing around in your car . Go to your closet pull one out, you’re done. It’s only for transport since you don’t work ‘out of’ a bag. If the aim is photography I think you’ve covered the subject. I can completely get behind Bernd's decision on the Volvo. If you buy the Billingham, are you sure it will suit your car? Maybe you should now "shop" for an Aston Martin DB11. In jet black or magnetic. I think I should tattoo parts of this on my forearm! (Except I am opposed to tattoos-at least on my body.) And Bernd Reinhardt's comment was great too. I have done these same things so often, and then asked myself "What were you thinking?" Mike, you express it much better than I ever could. Great job. Here's a contrarian view, FWIW: Given that you prefer to carry only one camera and lens at a time (in this case your G9 with 12-35mm zoom), then why do you need a camera bag for your outings at all? Whenever you want to leave your camera and lens in your car, just place it on a seat or on the floor and toss a jacket over it, or stick it inside a large recyclable grocery bag. You've hidden your equipment without drawing attention to it and saved yourself $250 in the bargain. Just think of all the time you'll now have free to shop for other crap. As Oscar Wilde put it the only way to get rid of temptation is to yield to it and the marketing guys know it. I'm with Stephen Scharf on the Spectral 8. The Billingham 335 does fit a 13” laptop... been using one for years. The Billingham L2 is perfect for your small kit. I can just fit a 5D4 with a 35/1.4L fitted and a 135/2.0L, plus an iPad mini and a passport. My minimalist travelling kit. So you really need two more Billinghams. Go to a secondhand clothing store get a kids back pack, simple effective disguise. Back in the day window shopping was much safer. Now we have the window and a "put in cart" button right there. I used to do exactly what you are doing. Buy one thing and then another to go with it. Now I just use the new camera first and interestingly, I eventually found that I don't need anything else to go with it, and the old bag is still good enough. Maybe I am just reassuring myself that my reflexive purchase was a good idea on the first place?! That’s headphones & related accessories for me. In the Michelangelo Antonioni film Blowup, the photographer character Thomas (do we ever learn his last name?) comes out of a flophouse (where he has been photographing surreptitiously) and gets into a Rolls, taking his Nikon out of a paper bag and putting it into the glove compartment. So that could be your camera bag: the glove compartment of a Rolls. Does the following make you feel better? In Seoul there are several bookstores that I shop on every visit. On my last trip to the city at the first of these shops I found a book I just had to have, so I bought it (and half a dozen other books). A couple of days later, at the second of my must visit bookstores, that same book caught my eye and ended up in the shopping bag again (with another half a dozen books). After a side trip lasting several days and with only a few more days left in Seoul I hurriedly hit up the last of my must visit book shops. Once more the same book caught my eye and joined half a dozen other books leaving the shop with me. To make matters worse, it wasn't the only book I accidentally bought multiple copies of on that trip. At least I've got plenty of photo friends who like books. The comment about the Jaguar automobiles is so funny to me. The only people who notice Billingham bags are people like us who read Mike's blog. The rest of the world thinks nothing of them. They just look like a reasonably smart brief-type case (if its a thin Hadley type). As a Brit, I find it fascinating that the US photonerd world treats them as if they come straight from Downton Abbey. Not really sure why, as they don't have this image back in the UK particularly. Is it some kind of reverse snobbery or chip-on-shouldery? I have an aversion to Bllingham bags, at least for the small Hadley version. It was that bag I had slung over my shoulder on a crowded Prague subway in 1997. After departing the train car and going up the escalator, I realized one of those folks crowding me so tightly on the subway had undone the leather straps off the brass nubs that held the flap, reached in and relieved me of an almost new Contax G2 (and exposed roll of film containing what I’m sure were many Pulitzer quality photos ... ). Had the bag at least had an internal zipper as secondary security, I might have felt the theft. Of course the bag was not at fault—my naiveté about travel security was the culprit—but the emotional me thinks back and still blames the damn camera bag. This might put a damper on the expensive shopping. If you really want something "nondescript so it doesn't call attention to itself in the car" get a six-pack size cooler. Perhaps one a little larger, and put an insert inside. People aren't likely to break your car window to steal what looks like your lunch. When you are out of the car taking pictures, leave the bag in the car and carry the camera with a shoulder strap. The day I spend over $300USD for a camera shoulder bag is the day I seriously question my sanity. I generally buy used camera bags that are already broken in. That way they are more usable and don't scream "steal me". Never mind the bag, that Rolleiflex 6008 is making me want to spent money. I have I think two Billinghams that the former manager of the ICP bookstore gave me, but what I actually use for carrying stuff in the car is a $8 tool bag from the army surplus store with a lining made from several layers of bubble wrap FedEx envelopes. In October 2017 I learned the hard way not to re-read my 'blog. So many times I had what I now see was an ideal kit - a blend of my mix of features, near-criminal price discounts and a good blend of focal lengths and other bits. Then I shop a little more, find a kit-busting new lens or a slightly better body, which budgetary circumstances soon force me to sell - and I'm wandering the virtual stores again. I thought I learned not to pick at healing wounds about fifty years ago, but apparently I was wrong. I kinda agree with Gordon Lewis. Maybe you don't need a bag. For some time, I just used one of OpTech's Digital-D Soft Pouches to cover the camera and lens. It provided some shock and weather protection, and was as minimal as you can get. It's easy to hide, but the straps could give it away. The solution is to just carry it with you, and since I used on of their Utility Sling straps, it was easy to secrete it somewhere under a jacket. Otherwise, if you're still looking for a small bag, the Tenba DNA 8 might fit your bill. The thrill is in the process and the end is anticlimactic. I learned a long time ago, although I don't always adhere to the lesson, to get what you want and nothing else. If something is sorta like the thing you want, don't buy it. Get what you want. If you want a Stratocaster, don't get something that's just as good or even better than a Stratocaster, get the Strat. In your case, you want a smallish black bag. The consensus on your bag thread was that Think Tank was probably the best brand choice, and guess what -- they have a smallish black bag, and it's not too expensive. (You're an idiot for not getting the Retro 5, as somebody has already pointed out, and if you need to hide it on the floor of your black-interior car, a black garbage bag would do the job nicely. Plus, the Retro 5 is less visible when carried. But that's apparently not what you want.) Get what you want. This is a good one "...you idiot, it's not even what you're looking for". Next time I go shopping I will do my best to remember it . As for camera bags, I own six, I am bad. For a few years now, I've used a free AARP black bag to carry my Fuji XE3 or XT2 with a lens (16-55 or 90) attached. It has a front pocket that will hold a small lens (e.g., 14 or 27 ) and a little side pocket that hold extra batteries. I bought another one I found at Goodwill for $3 as a back up bag. I've added a bit of foam padding to the inside bottom of the bags. I especially like the zip top that allows quick access. I prefer to travel light, otherwise I often find that I don't travel at all, which defeats the purpose of owning ANY camera, at least for me. It's a good thing we have the internet. If you guys spent as much time in real camera stores drooling over gear as you do in front of a screen, the poor sales people would have gone completely crazy.... and then out of business when sales declined, because a) no paying customers could reach the counter and b) because no bag was THE perfect one. OTOH if you could actually try some of these bags in a real store, you might a) be able to choose and b) purchase one. I was at the one remaining photo lab in my town today and they have a selection of Think Tank bags. As I could use a new medium bag (my Domke is used up after 18 years) I will go back and check them out. So I'm not quite immune. If you want to feel better about yourself, check out "The Film Camera GAS Factory" group on Facebook. You will realize that you are a mere piker compared to most of these people when considering your shopping habits. By the way, I only use Facebook for a couple of private groups dedicated to film based photography, where I have learned a lot. I have no public presence to speak of, nor desire for one. It always takes me 3-6 months to stop shopping for a car after buying one, and I have to force myself to not have something to shop for, photographically, even if I never buy anything. But all the bag commentary reminded me to order a new insert for my Domke, after only 30 years the velcro ripped off. Gotta love a company that still is making the same gear 3 decades in! Mike, a camera bag is just a bag. Buy any nice bag, add some Domke inserts, and it's a camera bag, preferably with some added pockets for other useful stuff, or a tablet. I have used two of the canvas messenger bags in this collection for a very long time, and they hold up exceptionally well. I also quite like the Fybrenite and the new color scheme with the darker (chocolate) straps. It's also available in black. Go for it. I got one of those Hadley Small Pro, it is a fantastic little shoulder bag. Cargo pants. One lens in each cargo pocket. Your camera on your wrist. Cool, cheap, fashionable and hipper than the hippest hipster. Just for your camera & lenses in basic black? The Dome f-5XA works for me. I've never owned either, but living 25 mins east of the home of Billingham Bags in economically depressed Cradley Heath, and 40 mins south west of a Jaguar manufacturing site, also rather depressed, I'd be delighted to know that Mike's friends are buying either one. I can imagine a Billingham bag in my own future, but not a Jaguar: it's not my kind of car, which is boring, utilitarian and electric. Most of the time I don't use a bag at all. The camera strap goes over the headrest on the passenger seat and that's all it needs for safety whilst driving. I bought a Lowepro Stealth Reporter D200 AW some years ago because I wanted something in which to cart my Nikon with a 2.8/180mm attached. For my usual rig of a Nikon and just a 1.8/50mm I use nothing, if it's dry, and a plastic bag inside another plastic bag if in doubt about precipitation. I used to use this case (attached) during my active years, the straps festooned with luggage tags that allowed me a pleasant rustling sound when walking along a beach somewhere. It probably kept mosquitos at bay, too. That it might have been seen as an advert for thieves didn't seem to matter too much - but hey, I was able to run quite well in those days. Clearly, I ran out of glory space on the cameras case itself. Neither case has been used in an eternity, but with the first one (brand forgotten and nothing on it to remind me today), at least I did get to add some wear. Although I am happy I haven't caught the bag bug quite the same way others have. I did buy an OMD E-M1 Mk2 the other day, as a kit with the 12-40 PRO. I was shopping around for the 12-40, but even used from reputable places it was high. Speaks well for the lens. There were bundles with the E-M1.2 for $2K, so I rationalized buying the kit by realizing I'm eligible for Social Security in June, and my first check in July (apply in March!) will cover most of the cost. And each represents a significant discount on a new purchase. So I wasn't, er, foolish. But "owning" the thing isn't quite the same dopamine hit that shopping, comparing, awaiting arrival is. I read somewhere that buying a lottery ticket is about the same dopamine reward as actually winning, which is why losing money on lottery tickets is a money-maker for states. They keep coming back, again and again. I really should just meditate more. Better late than never to the party. I really enjoy my Olympus m4/3 cameras and lenses. The results are perfectly fine for me. I keep looking at the reduced prices for the Nikon D750 and wondered if I was missing something important by not using "full frame" gear. I look at new, at used and so far have resisted the temptation. But I keep looking at it. Back in the summer of '17 I decided it was time to retire my Honda sedan in favor of something more fun. Only problem is that I didn't know what I wanted. This lead to me shopping for cars online for a good three months. What fun it was! I finally bought a lightly used F-150 in January of last year. Well, long story short the F-150 was a piece of crap. Within a few months it was in the shop for major repairs, and part of me decided right then that I'd better unload it before it was too late and I really took a bath on it. But I really didn't want to pay sales tax AGAIN, so I proceeded to shop for *another* vehicle from March until October when I finally had enough of the Ford, sold it and bought a Toyota. I more or less car shopped for an entire year. Part of me loved it. I could do it any time I was bored, and of course configuring cars online is fun. But another part of me grew to hate it. By the time the Ford went and I bought the Toyota I was thoroughly sick of car shopping. I think it is (with me) because romantic day dreaming, retrospective loyalties, unscratchable itches and perpetual restlessness sneak up on mr "sensible shopper" sometimes, especially when the above are most relevant. When buying camera bags I am transported back to 198x, blue Amco jeans, old Nikons, a train somewhere third world and a potential Nat Geo assignment (always have, probably always will). The sensible side is usually looking for a better, newer, smarter and more practical solution, but when the other side wins I buy a Filson/Domke/Billingham. Last two bags; Domke f3x rugged (olive-rare) and Think Tank Turnstile. One all by my reckoning. I stumbled across a therapy. In evening, while shopping, do not close the various links/tabs associated with all of the sites visted. Close computer rather than shut off. Next morning review and close the links/tabs from night before. Reflect on how glad you are that you did not do anything stupid, i.e. push the buy tab, the previous evening. That is why retailers spent vast sums of money on marketing experts - to drag you down that rabbit hole. Some people have "a little black book". physically small (little) black camera! I must say, there is nothing (well, almost nothing) more I enjoy than sipping a scotch and shopping for stuff. I have pretty good restraint but every once in a while a little devil jumps off my shoulder and clicks on the "add to cart" button.